Roghni Roti is a soft roti prepared using only milk and ghee and has a good shelf like as it can stay for a week. I adapted this roti from the book “The Essential Andhra Cookbook with Hyderabadi and Telangana Specialities” that talks about the food during the Nizam rule. An only partial book is available for reading, and even that was such an interesting tale to read about food and culture many years ago. As the book mentions, this Roghni Roti is a basic roti, where you can make other versions using the same dough. The book has some wonderful suggestions, even for tough alphabet if you are into nonveg. This roti gets its name Rogni derived from the Persian word Rogan, which means butter/fat. What was interesting was that this Roti is also found in the Mughal Cuisine in UP by the same name, where they also call it Safar Roti. The Chapati in both the cuisines is made the similar way and almost the same approach. The dough is made with only milk and ghee, cooked with ghee. This roti will stay good for a week and is good to eat when it is cold as well. This is one roti we can make if we are going to travel and want food during our journey. I felt the chapati looked so excellent and yes it tasted awesome too. Rogni Roti is my choice for R in the AtoZ Flatbread and more, where I am doing AtoZ Indian Flatbread. 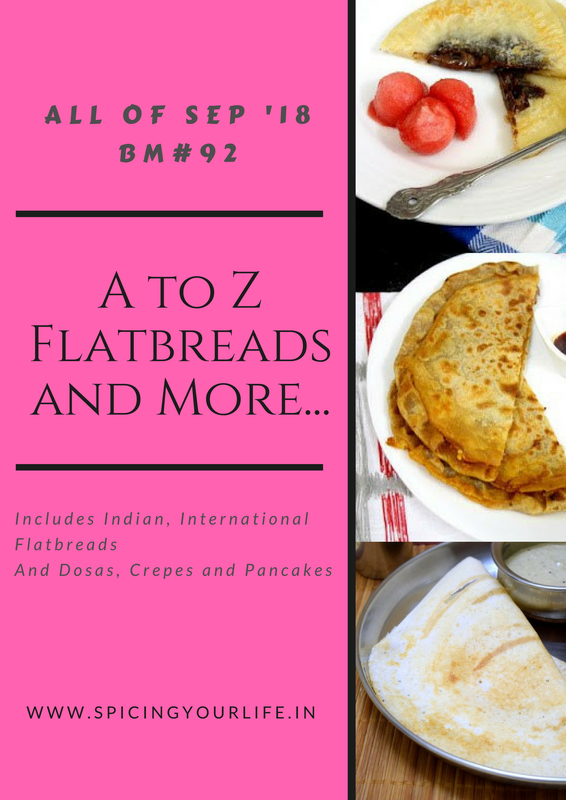 If you are keen on knowing whats R in AtoZ Dosa Varieties, check out! In a bowl, take the flour, salt, and the ghee to be mixed. Mix well. Add the milk and knead to a soft dough. Continue kneading for 10 mins. Pinch out equal balls from the dough and roll out to 6 inch discs. Heat a tawa and cook the roti on both sides with ghee. Gently press down to ensure the roti is cooked on all sides. Then add the milk and knead to a soft dough. Continue kneading for 10 mins. I have never heard either Roghani or Safar rotis , strange but my Gujju friends make some rotis binded with milk . I don’t think they have any special name for them , but yes they are perfect as travel good . These milk rotis taste delicious , even Inmake them sometimes . Rotis kneaded with milk sounds heavenly! And I would love to read that book with the food stories during the Nizam reign. What a unique pick Valli. Hats off! The roti must be so soft because of the milk in the dough. Cooking chapathi in ghee is one of my childhood fav and even Sruti likes it a lot. Will try this for her lunch one day..
Once i have accidentally prepared my dough with milk, never knew that is roti do exists. Such a soft roti, seriously an interesting rich pick from Hyderbadi cuisine Valli. Love to cook my rotis with ghee, will definitely make this roti for the sure. With a generous amount of ghee this roti must be really soft. My mother in law would always recommend adding milk to make roti dough. Lovely to get to know so many different names of flatbreads from India. This bread looks so soft and goes with any gravy dish. This roti looks so yummy and delicious. Would love to have this for my morning breakfast. I love that flavorful roti. This is a great one for kids with milk and ghee. It should be very soft right? The chapathi with milk and ghee and then cooked in ghee must have been so yum! Love the name of the dishas well!